Daily Beauty Tools Oil Blotting Linens. Blot away excess oil with eco-friendly blotting linens. Carefully remove one sheet of oil blotting paper in correct direction. and apply onto skin to remove excess sebum. 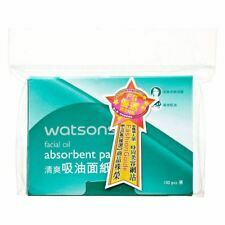 Description Facial Oil Absorbent Paper 100 sheets*5 packs The item will be shipped in 3 business days. Once posted, the post might take up to 21 business days to deliver you the item. 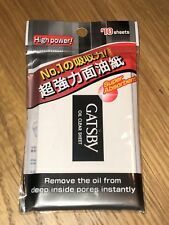 Gatsby Oil Clear Sheets. - Highly absorbent film. - Specially developed super absorbent material from Japan. Softer than paper, these silky sheets leave your skin feeling refreshed by instantly removing excess oil and shine from your face, without smudging makeup or leaving behind powder. 100 oil absorbing paper. We'd like to settle any problem in a friendly manner. We want to make sure you are happy with our item. Goods without RMA number will NOT be accepted. Color: white. Material: Natural jute pulp. Daily Beauty Tools Oil Blotting Films. 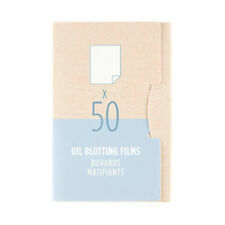 Blot away excess oil with this set of 50 silky soft blotting sheets made. Carefully remove one sheet of oil blotting film in correct direction. and apply onto skin to remove excess sebum. 1x 1box(100sheet) Blotting paper. Feature: Portable,practical and easy to use. Target area: Face. Color: As the photo shown. If you haven't received ite. Powerful blotting papers from Japan. Ingredients : 100 % pure linen. Blot away the perspiration glow after a workout. Great for oily skin. USE TO REMOVE EXCESS FACIAL OIL OR CLEAN MAKE-UP Product Features . 1x 1box(100sheet) Blotting paper. Feature: Portable,practical and easy to use. Target area: Face. Color: As the photo shown. Size: 9x6cm. 1x 1box(100sheet) Blotting paper. Feature: Portable,practical and easy to use. Target area: Face. Color: As the photo shown. Nail Beauty. Sun Protection. Clean & Clear. UPC 4710032502446. 페이스샵 블랙헤드 코팩 Missha Magic View Oil Paper ***** We always sell an Honest & Genuine product. **** **** We have our own off-line Shop. **** **** We promise to be a reliable business relationship. **** We ship all products all over the world excluded some country. (We do not ship to Africa and Italy addresses.) We will ship your order within 3 business days after payment is received. We use both Economy Int'l Shipping and Expedited Int'l Shipping. The following shipping options are available when you check out. - Economy Int'l Shipping is inexpensive and fit for small packaging (less than 2kg). This shipment method usually takes 10~20 business days after shipment. Itinstantly soaks up excess oil andremoves shines from your face, without smudging makeup or leaving behind powder. It is softer than paper, these silky sheets can be used easily around your nose and other areas of your face. Avoid acne and skin irritation. ① Wipe face before makeup, makeup can make more effective, natural and moving;. ③ can be used to clean the lens. Color: As the picture shows. And absorbs oil on face without dryness. Carefully remove one sheet of oil blotting paper in correct direction. It absorbs excess oil without disturbing makeup. and apply onto skin to remove excess sebum. 1 Case of Face Oil Absorbing Sheet(Total 50sheets). Soft and gentle to the skin, easily absorbing excess oil. Type: Face Oil Absorbing Sheet. With a mirror case, perfect for applying makeup. Features: Portable,Practical, Easy to Use, Mirror Case. Main Ingredients:Bamboo Charcoal Extract, Etc.Bamboo Charcoal Extract, Etc.Skin Types:Suitable for various Skin. 1x 1box(100sheet) Blotting paper. Target area: Face. Feature: Portable,practical and easy to use. Color: As the photo shown. If you haven't received ite. This O il A bsorbing Paper for effectively face oil blotting. 100 sheets Face Oil Absorbing Paper. Note: The real color of the item may be slightly different from the pictures shown on website caused by many factors such as brightness of your monitor and light brightness. Instantly remove excess oil. Won't smudge makeup. Softer than paper, these silky sheets leave your skin feeling refreshed by instantly removing excess oil and shine from your face, without smudging makeup or leaving behind powder. This Oil Absorbing Paper for effectively face oil blotting. 80 sheets Face Oil Absorbing Paper. Ingredient: Wood pulp, Green tea essence. Flavor: Green tea. Quantity: 80 sheets/box. Note: The real color of the item may be slightly different from the pictures shown on website caused by many factors such as brightness of your monitor and light brightness. Item Type: Oil absorbing Paper. 1 Box Oil Absorbing Paper (100sheets). Glossy on both sides for oil blotting. Target Area: Face. Flavour:As the picture show. 1 x 50 Sheets Oil Absorbing Paper. Make-up before you wipe the face, can make more impact, natural moving. 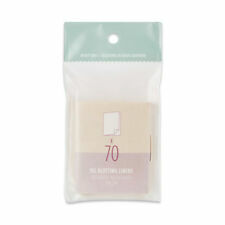 1x 1box(100sheet) Blotting paper. Target area: Face. Feature: Portable,practical and easy to use. Color: As the photo shown. ✓ EASY TO USE DISPENSER! Our easy-to-use dispenser assures one-sheet for your use, avoiding waste while keeping the remaining tissues safe, fresh and sanitary. You won't lose! Solve your trouble with oily skin Now! Oil Olotting Paper. We are happy to provide answers promptly and professionally. If you want to buy more than QTY listed. ■◆TOP Seling Item Now◆■. Bulk order. SNACK CAKE. Ingredients: raw wood pulp, hemp pulp, green tea tree extract, etc. The facial tissue is smooth and contains green tea extract. Cleanse redundant oil of skin, reduce the burden on your skin and keep the makeup. Colour: Black. Item Type:Oil Absorbing Sheets. Relieve the burden of face which can keep your face refreshing. Absorbing the redundant oil from the face easily and quickly. 30 sheets x Oil Absorbing Paper(other accessories demo in the picture is not included.). Good flexibility, not easy to break. Smooth surface, will not destroy your facial makeup. Gentle care for the skin, remove excess dirt and grease from skin surface. Clean skin, reduce skin burden, make you face refreshing and clean.